← Collaborative Efforts, Market Development…then Competition? One of the most interesting visits on our tour of energy was the trip to E-On. E-On is a German energy company that positions themselves strategically in the markets of renewable energy. To be more specific, they take a particular interest in developing and implanting new technologies that have a positive effect on the sustainability of the energy market. The office that we visited is responsible for constructing and maintaining Rösand II, the largest of six offshore wind farms that E-On has been a part of. It also happens to be one of the largest off-shore wind farms operating in the world today (1). With 90 turbines, it has a capacity of 207 MW (2). It was really fascinating to learn about the Danes love for renewable energy, wind energy in particular. Their methods of designing and implementing such a massive project were just remarkable. One of the key facts about Rösand II that many people probably won’t find interesting but I was impressed by was the layout of the actual wind turbines themselves. Unlike a traditional wind farm that is laid out in a square or rectangular grid, Rösand II is designed in bow-like placement. This layout of turbines enables Rösand II to achieve the efficiency of a traditional wind farm with 91 turbines; giving them the output power of 1 extra turbine without actually having to construct or install any additional components. The fact that they conceived and designed this idea is so amazing. Overall, I was impressed by the Danes teamwork and collaborative efforts but especially so with the Rösand II offshore wind farm project. As I was listening to the presentation that was given, I couldn’t help but think of the possibilities of such a wind farm in Maine. I knew from previous conversations and articles I had read in the news that there were in fact talks of such a wind farm being proposed for locations in Maine. The concept is a great idea for the state of Maine as there are an incredible amount of advantages that make Maine an ideal location for an offshore wind farm. The first and most obvious is that we have a lot of access to coastline that would help construction and maintenance of the actual farm itself. There are many locations along the coast that could be chosen for such a wind farm to be constructed. Another really positive argument for wind farms in Maine is that they have been garnering a lot of attention lately. People are beginning to recognize our need for a separation from fossil fuels. 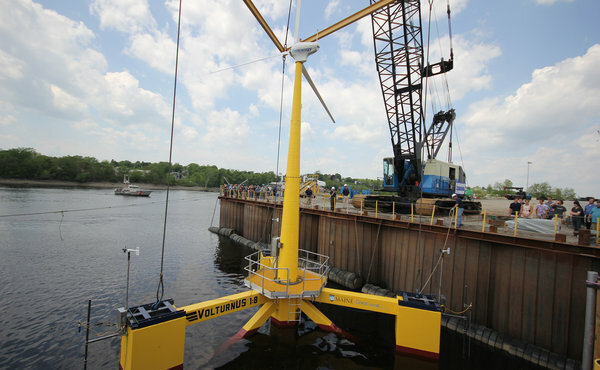 An upcoming project led by the University of Maine is actually placing a test turbine offshore for testing and pilot purposes. This will help the team to develop a full wind farm in the future. The coolest part about the development of offshore wind farms in Maine is the fact that a traditional wind turbine is not a viable option. All of the areas in Maine that are optimal in terms of actual wind for power generation have waters that are much too deep for a foundation to be mounted in the seafloor. That has forced teams that are working on this project to develop a new “floating style” of wind turbine (5). Similar to the Danes, I am blown away by our ingenuity and resourcefulness when faced with a problem. Even though the wheels are moving on offshore wind projects, we can’t stop there. This is a train that must be full steam ahead. Danes learned the hard way during the 1970’s that carbon fuels are a finite resource and something had to be changed in regards to their dependence on them. Unfortunately we have not felt that pain here in the United States or more locally in Maine. In order for projects like this to continue we must have leadership efforts from multiple sources. Our governments, local business and even individuals must make our separation from fossil fuels a top priority. The renewable energy market has slowly begun to develop and needs to move forward at even faster rate. The availability and capacity for power generation through offshore wind farms is staggering; over 4000 gigawatts, which is four times what our current power generation here in the United States is. (4) Once our country fully recognizes and embraces the need for renewable sources of energy will we be able to sustain ourselves for generations to come. This entry was posted in Wind energy. Bookmark the permalink.